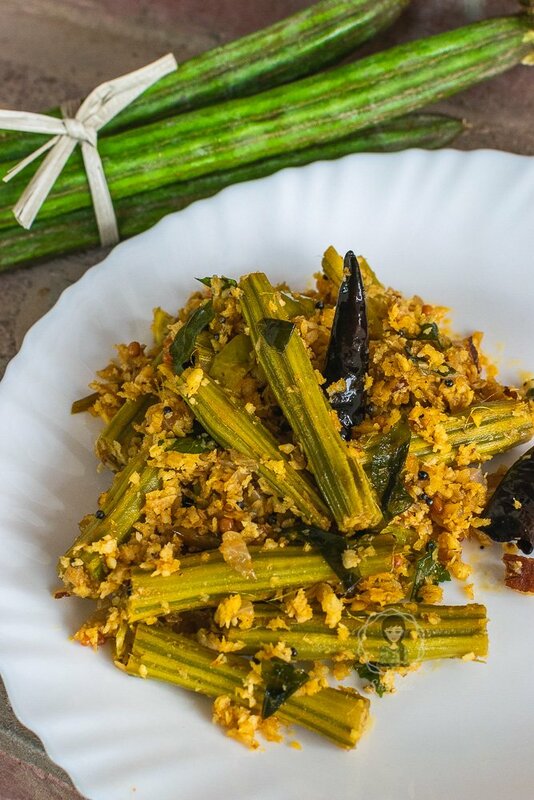 A healthy and delicious side-dish, Muringakka Thoran or Drumstick Stir Fry is prepared by stir-frying drumstick pods with shallots and grated coconut. Drumstick is a vegetable available in abundance in Kerala. We make dishes out of it various styles that one can’t even think of. For the world, this nutritious vegetable is used only to be added as one of the main vegetables in Kerala Style Sambar. But for us, it is one essential element of our everyday side-dishes for lunch. Many houses in Kerala boasts of having a drumstick tree in their yard with their tens of long, slender pods in branches. Drumsticks, their leaves, and flowers are a powerhouse of nutrients and are used for cooking. It is known to improve digestion, regulate blood sugar, good for the bones, and boosts immunity. There are various ways to stir fry drumsticks. 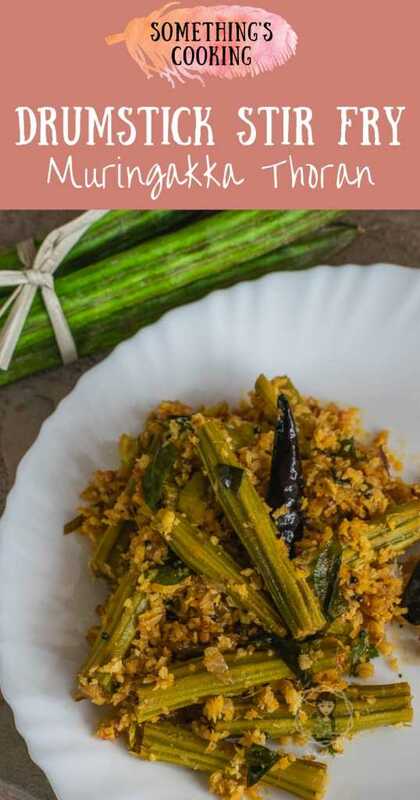 I have shared a simple Kerala Style Drumstick Fry before where drumsticks are fried in spices and no other main ingredient like coconut is used. 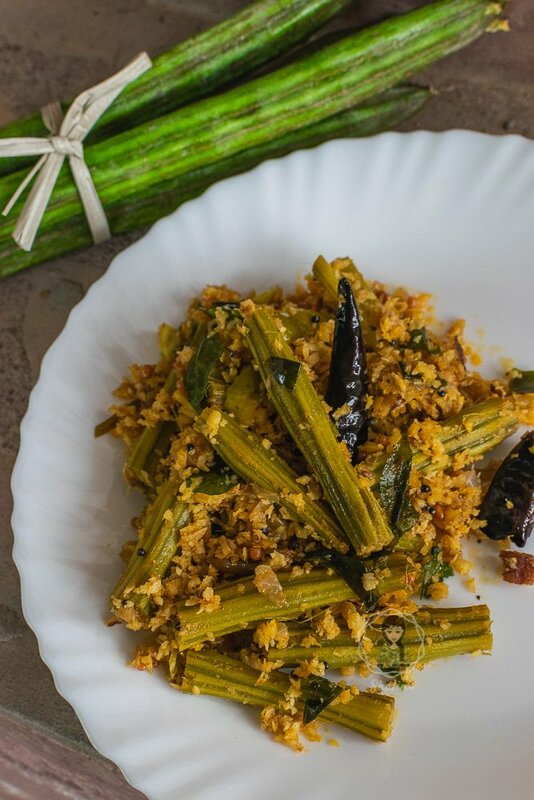 In this recipe of stir fry, we use grated coconut as well. You can also add jackfruit seeds, but I wanted to keep it simple. Wash and clean the drumstick pods. Using a knife, scrape the skin. You needn’t peel off the entire thing because the hard skin does add texture to the dish. Cut into finger-length pieces and wash well. If you get thick pieces, you can slit them into two for cooking. Heat a tablespoon of oil in a pan. Add chopped shallots or onions, curry leaves, and chopped green chilies and saute until tender. Add the drumstick pieces and season well. Add turmeric powder, Red chili powder, and coriander powder. Mix well and add a quarter cup of water. Cover and cook in low flame for about five minutes. Coarsely grind (or Pulse in a mixi), grated coconut and cumin seeds. Add this to the drumstick, mix and cook until dry. Prepare the tempering by adding mustard seeds, dry red chilies, and urad dal. Add it to the drumstick. Easy-peasy! Add chopped shallots or onions, curry leaves, and chopped green chilies and saute until tender. Add the drumstick pieces and season well. Add turmeric powder, Red chili powder, and coriander powder. Mix well and add a quarter cup of water. Cover and cook in low flame for about five minutes. Coarsely grind (or Pulse in a mixi), grated coconut and cumin seeds. Add this to the drumstick, mix and cook until dry. Prepare the tempering by adding mustard seeds, dry red chilies, and urad dal. Add it to the drumstick. Easy-peasy! Serve hot as side-dish to rice. Have you had Drumstick? Which recipe do you follow for cooking this vegetable? I love this series of yours! You are featuring all my favorites! I love drumstick in every form and this is my favorite as well. I usually add some roasted peanuts to this as well. Even I use it only in sambar, as this is the only way I was aware of till date. Recently my hubby asked me to include this more in our meals and was planning to look out for its recipes. And here comes your recipe at the right timeThanks. Drumsticks are used often in Maharashtrian cooking especially Dal. My Mom makes a yummy raita with Drumstick pulp. 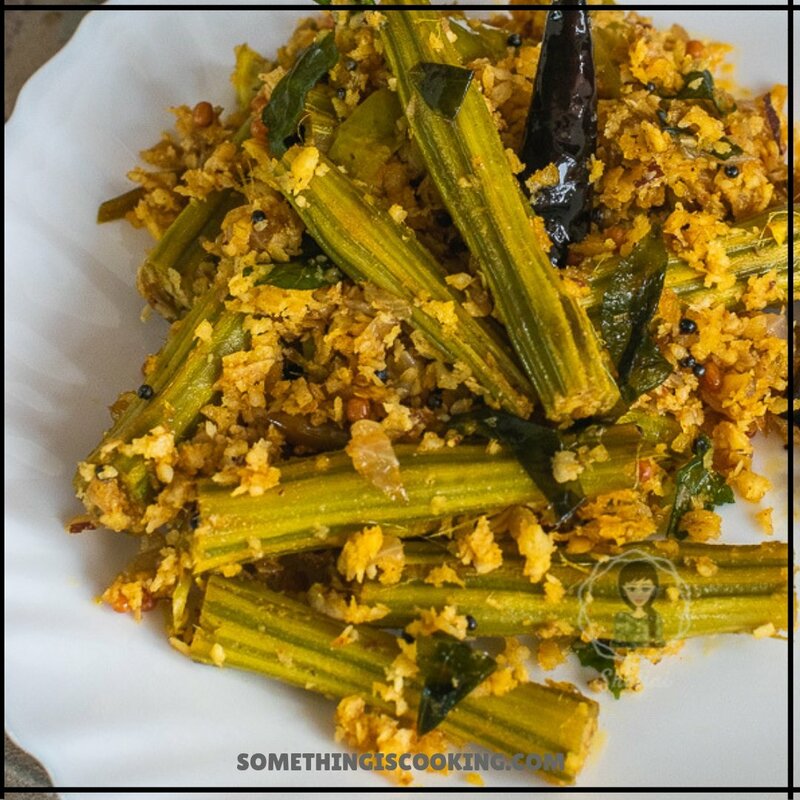 I have once made a vegetable using very tender drumsticks… Sadly forgotten the recipe and such tender ones are not available in the city unless one has a tree in their garden! 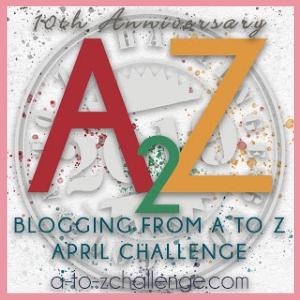 Happy AtoZ! Oh wow! I would love to try that raita! Let me try to find out the recipe. I have always had drumsticks in sambhar, but never as a dish. You have inspired to make the stir-fry version. 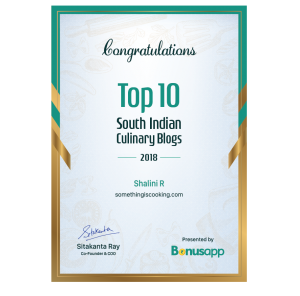 Thanks for the recipe, Shalini! I love drumsticks in my daals and sambhar. it’s a rich source of calcium & iron and I include it in my meals for sure. definitely will try this dry way. I have never heard of drum sticks here in Atlanta. When I first looked, I thought it was okra. Looks good. it sounds easy. I have eaten this but not thought of preparing it. Drumsticks are high in B12, so I eat them often. We make this dish the same way, except for adding coconut to it. I am going to add coconut to it the next time. This looks really simple, Shalini. I am definitely going to try out this recipe. My husband loves drumsticks and they also have a drumstick tree in their house. Would love to try this recipe. I always run away from drumsticks and only know about it’s use in sambhar. I know the health benefits of drum sticks but never cooked it. As this is quite a simple recipe, I will give it try.